Anonymous, Funerary Portrait of the Boy Eutyches (c 100 - 150 CE), encaustic on panel, 38 x 19 cm, Metropolitan Museum of Art, New York. Wikimedia Commons. A hauntingly beautiful portrait of a young adult woman lost in quiet thought, made to fit on her mummy. Was she contemplating her eventual death? A portrait of a young adult woman, including her head, shoulders, and chest. She wears a purple tunic over which there is a yellow cloak, fastened in the centre of the chest by a large oval brooch containing a large emerald. A pearl necklace is around her neck, obscured by applied gold leaf. The woman is turned slightly from full frontal view, but her head remains square to the viewer. Her eyes are cast slightly to the (viewer’s) left and downwards, so as not to look directly at the viewer. She has black hair swept back and plaited across the crown of her head; the gold head of a securing hairpin is visible at the very top of her hair. Her ears are prominent, each having an ear-ring of two large pearls astride a dark stone. Her eyes are large, her complexion fair and European in colour, and she appears lost in quiet thought. Anonymous, Funerary Portrait of a Woman ‘The European’ (c 80 – 200 CE), encaustic on cedar panel, 42 x 24 cm, Musée du Louvre, Paris. By dalbera from Paris, France, via Wikimedia Commons. Rendered in fine, close-packed strokes of encaustic wax to model the form, the eyelashes have been formed by scraping away wax to reveal the underlying black ground. Originally painted on a rectangular cedar board, small squares of gold leaf were applied around her neck, and the board cut down to size to fit the facial area of the woman’s mummy for interment. 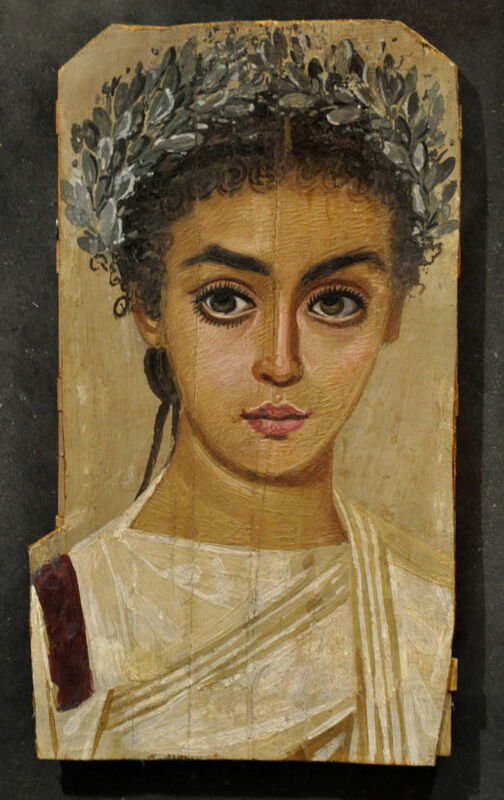 The painter is believed to have been one of many professionals who painted funerary portraits for the Romans who lived in the Egyptian city of Antinoöpolis, on the bank of the River Nile. Anonymous, Funerary Portrait of a Young Woman (c 120 – 150 CE), encaustic on panel, Liebieghaus, Frankfurt am Main. By User:FA2010 (Own work), via Wikimedia Commons. There are hundreds of these funerary portraits which have been extracted from the underground burial sites of the Roman settlements along the Nile Valley. Some have been removed systematically during careful archaeological excavations, including those in the Petrie Collection, London, but many were robbed without any records being kept of their origins, and put on the art market for quick profit. Among the most famous sites are Fayum, to the south of Cairo, Antinoöpolis further to the south, and Thebes, towards the southern limit of these Pharaonic Settlements. 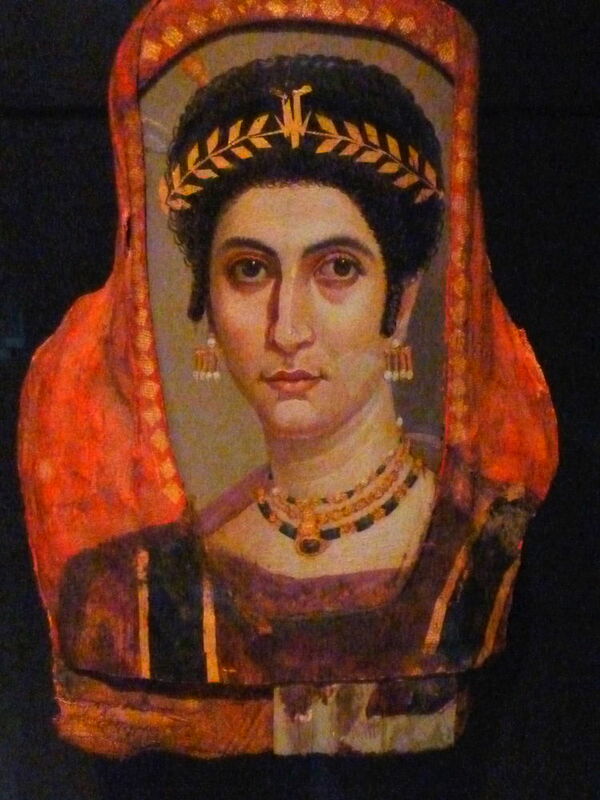 Anonymous, Funerary Portrait of a Woman ‘Isidora’ (c 100 – 110 CE), encaustic on panel, Getty Villa, Los Angeles. By Dave & Margie Hill / Kleerup from Centennial, CO, USA (Getty Villa – Collection Uploaded by Marcus Cyron), via Wikimedia Commons. Most are painted using encaustic wax on wooden panels, although a few feature the use of tempera. Their artistic qualities and styles vary greatly, with some resembling cartoons, others being exquisite portraits. Although painting in Classical times around the Mediterranean had become very sophisticated, many of these funerary portraits have great beauty, and sufficient artistic merit for them to stand with the centuries of portraits in oils which were to follow. Encaustic painting is still practised today, using paints based on a largely beeswax medium, which melts in hot water so that it can be applied by brush or tool, and solidifies in even the fierce heat of the Egyptian summer. Although many of these portraits have become badly damaged, there are others which have survived well in their cool, dark, underground tombs. Anonymous, Funerary Portrait of the Boy Eutyches (c 100 – 150 CE), encaustic on panel, 38 x 19 cm, Metropolitan Museum of Art, New York. Wikimedia Commons. Unlike death masks, funerary portraits were usually completed long before the subject’s death. However there was no doubting the purpose of a portrait, and it must have been quite eerie to sit for a portrait painter knowing that their painting would end up over your mummified body, sooner or later. This obviously affluent woman of high social standing was clearly contemplative when it was her turn to have her portrait painted. To see her face and distant gaze across nearly two thousand years is itself a moving experience. But despite the many differences between her life and ours, we also have much in common – not least the prospect of eventual death. Alain Jaubert, Palettes DVD: Les peintres de l’Antiquité, Fayoum, Le dernier regard, Editions Montparnasse. (A complete 30 minute programme in this superb series, featuring this painting.) Details. 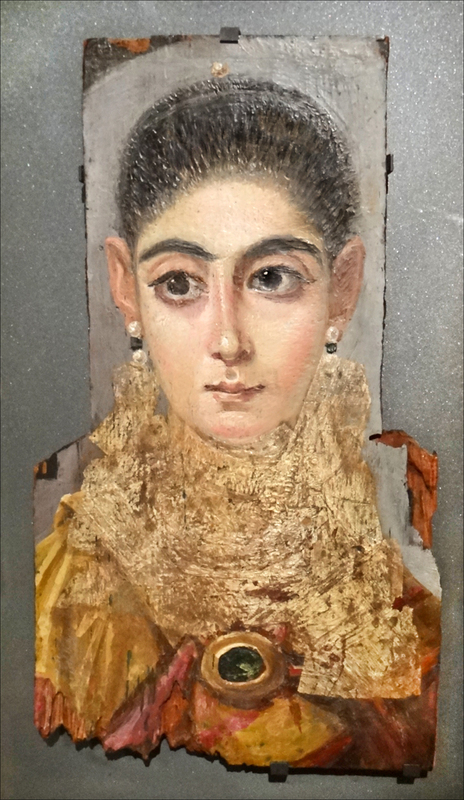 Posted in Painting and tagged Antinoöpolis, Egypt, encaustic, Fayum, funerary, painting, portrait, Roman, tempera. Bookmark the permalink.